I was on a men’s retreat a couple of months ago. We would break out into our small group of twelve and talk about what we had just learned in the big group, what we thought. The men’s ages ranged from twenty-something to 60-something. We got to talking about high school and cars and and other manly things. This question came up: What was the first big trouble we got into with a car? The guys began telling their stories of when they were in their junior or senior year of high school, when they were drag racing. Then it was my turn. My story took place at an earlier age than theirs did. A much earlier age. I was in the 7th grade. I’m from the country. 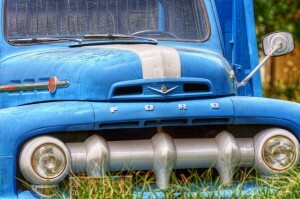 I drove the old blue Ford with the 390 and 4-speed over to the big stock pond. My best friend and I, with our parents’ approval, were going to fish all night and camp out in the truck. At about 2 AM, we decided to go exploring. In the truck. We were drawn to that nearby booming metropolis of six thousand and wanted to check things out. It was only six miles away and we used the graveled county roads as much as possible. Turning off one of those roads onto the paved highway made this trip a memorable adventure. I turned too sharply and we were lurching into space and crashing into a crater. I had securely lodged the truck into the culvert. Two rat terriers and .22 rifles tumbled out as we did, through the passenger window. I’ve been stuck before, but this was a long walk from home. And how was I going to sneak a tractor out of the barn and drive it all this way and pull out the truck without the cops catching us? Then I realized, what if cops come by here before we get it out? Luckily, a fellow who had a good truck drove up. He was a mature man of wisdom. He was old, twenty-something. If he wouldn’t have been so drunk, I don’t think I would ever have been able to convince him to get a running start with the long tow chain I provided and jerk that damned truck out of its tomb. I had to resurrect this truck and this night, or my dad would kill me. The guy finally followed my directions and we were free. Handshakes and hugs later, I was driving back home. That drive and arrival to the Back 40 was pure bliss. A few days later, my dad commented, “That passenger door is hard to open and close now. Wonder what’s wrong with Old Blue?” I didn’t tell for years.